The intent of the Women’s Recovery from Addictions Program (WRAP) is to create a secure and safe place for women who have been civilly committed for addiction treatment to detox and recover while receiving individualized supervision and therapy. The 30 bedroom center is split into two units, each with a secure outdoor recreation courtyard, surrounded by bedrooms. The overriding goal of the design is to provide a place of healing and peace in a safe and inspiring way. 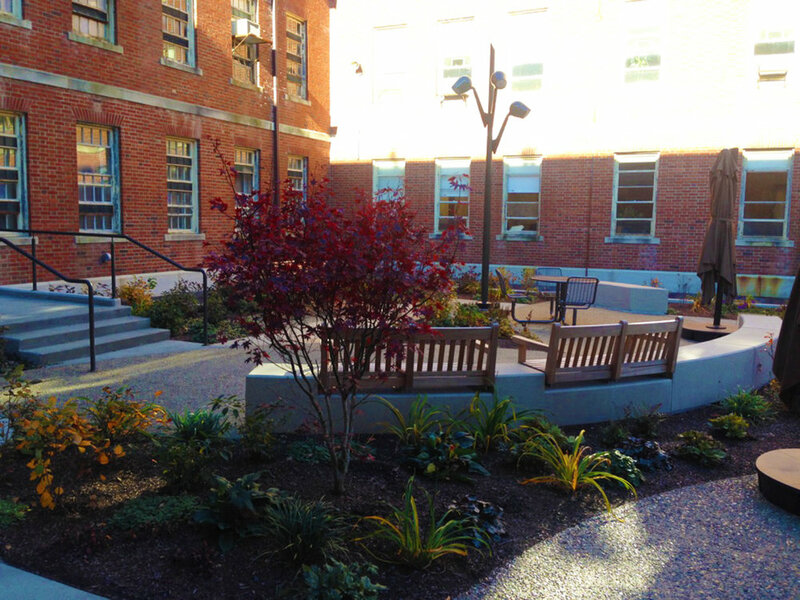 The two courtyards are designed to respond to different stages of addiction recovery. One courtyard is planned as a healing garden for the intensive detoxification stage. Multiple outdoor sitting areas are provided for individuals, casual gathering and small for group work. A perimeter pathway provides a place to walk and ample, low, textured planting provides the calm of nature and visual focus. 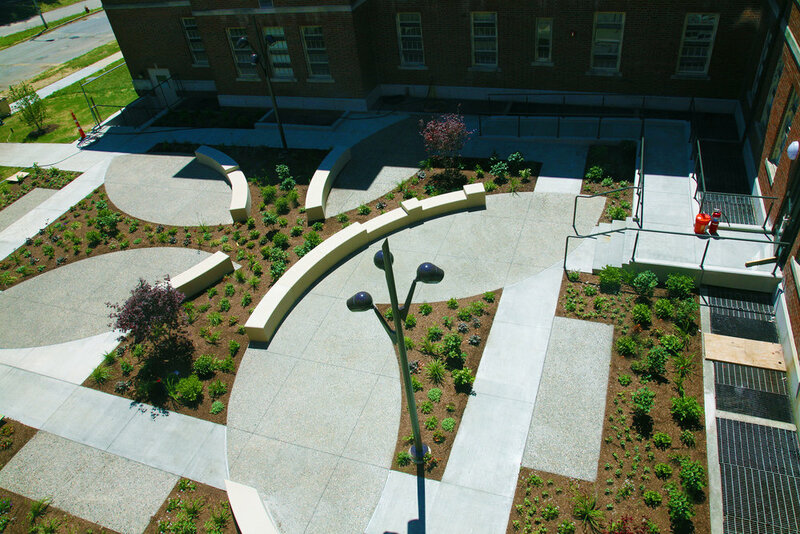 The other courtyard is designed for more active recreation and programmed use, corresponding with a later stage of recovery. This area includes a rubber surfaced sport/ yoga area as well as individual garden plots that the patients can tend. Both gardens are designed to be visually engaging from within as well as when viewed from the surrounding rooms with a blossom motif. 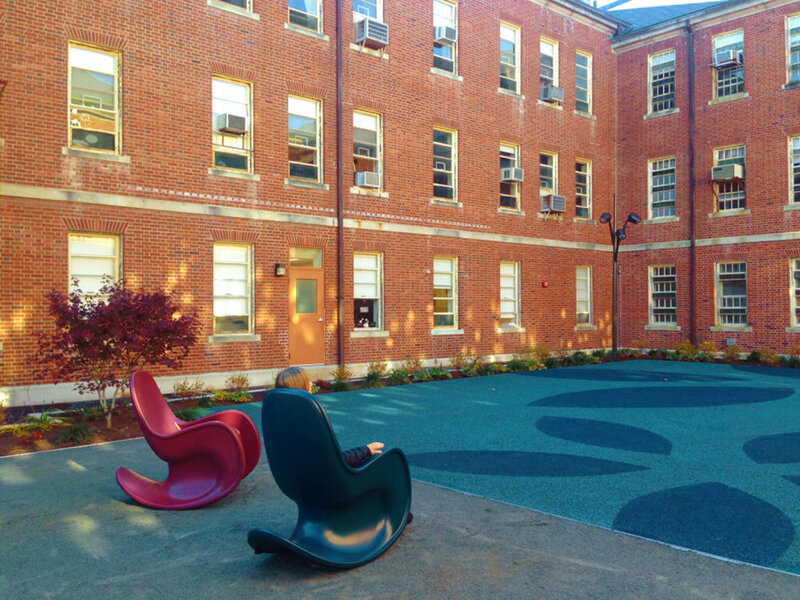 Given the severe physical and emotional stress of the recovery process the construction of the courtyards needed to be designed so that there was no possibility for the women to harm themselves or others. A plant palette was selected that provided interest and variety but was also non-toxic and non-hallucinogenic and all furnishing was either fixed or too heavy to be moved easily.